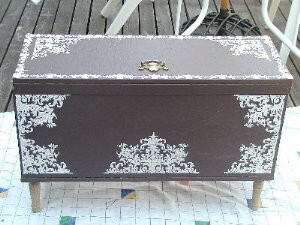 I love using plaster stencils on furniture! It’s one of the most rewarding things I’ve ever done in my life and I’ve done a LOT of plaster stenciling since coming out with the very first line back in 2004. My nephew, Guy Keesey hand built me this sweet little chest. I loved it from the moment he gave it to me. 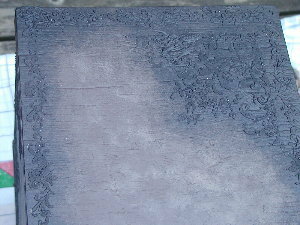 After coming out with my plaster stencils line, I searched my home for projects to do them on. This chest caught my eye and I knew it was the perfect start to what would become a complete passion for me! I began by painting the chest dark brown then using our plaster stencils to create corner, center and border designs with joint compound. 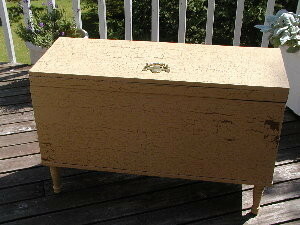 I then sponge painted a lighter beige paint over the plain portions of the chest (to lighten the background a bit) and then painted over just the raised stencil design with black paint, blending the edges over the light sponging. 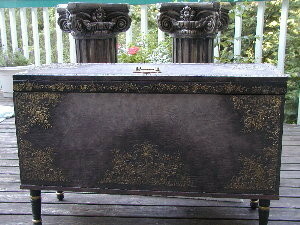 I replaced the stencil over the design and very lighted swirled metallic gold paint over the design. I painted the legs black and added metallic gold paint as banding. After a coat of satin varnish, it was complete and I love it! The finished chest was a total hit in my home!